Gene Hermanski, the former Brooklyn Dodger outfielder who suggested that they all wear number 42 to confuse the alleged snipers threatening Jackie Robinson, died Monday afternoon in Florida. He was 90. His death was confirmed by his wife Carol, after a brief phone interview from their home in Homosassa. Hermanski was born May 11, 1920 in Pittsfield, Massachusetts, but spent his formative years in Newark, New Jersey where he would become a standout at East Side High School. After graduating, he signed in 1939 with the Philadelphia Athletics and later moved on to the Brooklyn Dodger organization in 1941 after his Pocomoke City team disbanded. He served in the Navy and the Coast Guard during World War II, spending most of his time stationed at Floyd Bennett Field in Brooklyn. During his military service, he was granted a two-month leave in 1943 which allowed him to make his major league debut with the Dodgers. He hit .300 in 60 at-bats before returning to the Navy. While stationed at Floyd Bennett Field, Hermanski would play with the legendary semi-pro Brooklyn Bushwicks. Hermanski explained in a 2009 interview why he had to play under the name "Gene Walsh." "I had to change it [my name]," he said. "It was the smartest thing I ever did in my life. If my commanding officer ever found out that I was playing ball in some ball park, he'd ship me overseas." 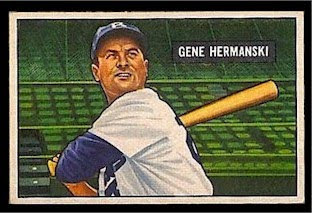 Upon his return to the Dodgers in 1946, Hermanski made the club as a reserve outfielder. It was there with the Dodgers that he witnessed baseball's integration happen before his eyes. Hermanski was the starting left fielder on April 15, 1947, the day Jackie Robinson made his major league debut. Ralph Branca, along with Hermanski, went over that day to greet Robinson with a handshake while Robinson was largely ignored by the rest of his teammates. He played in two of the Dodgers' World Series appearances (1947 and 1949), batting .308 in their loss to the Yankees in the 1949 classic. He played with Brooklyn until 1951 when he was traded to the Chicago Cubs for Andy Pafko. He would spend two more seasons with the Cubs before becoming part of the exchange between the Cubs and Pittsburgh Pirates that sent Ralph Kiner to Chicago. Hermanski would play one more season in 1954 with the Oakland Oaks of the Pacific Coast League, reuniting with former Dodger manager Charlie Dressen before retiring from baseball. He finished with a lifetime batting average of .272 over nine major league seasons. After his playing career was over, he worked as a sales representative for Tose Incorporated. At the time of his passing, he was the last living player from the Brooklyn starting lineup for Robinson's debut. Marv Rackley and Ed Stevens are currently the last surviving Dodger players that participated in that game.